On 21 September 2018 Capago International and Baz’Art staff, the Ambassador of France to South Africa, the Consul General of France in Cape Town, the Vice-Consul of Italy in Cape Town, esteemed guests and members of the press gathered at 18 Addison Street, Salt River (Cape Town). The occasion? 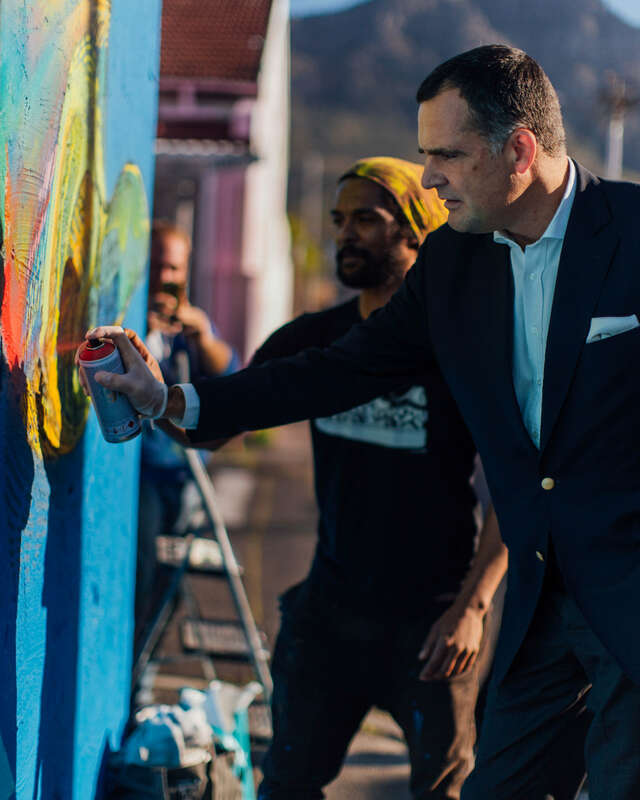 The unveiling of an impressive and internationally significant street art installation to celebrate Capago Cape Town’s recent venue refurbishment, and to signify the coming together of Italy, France and South Africa through Capago’s work. We took a closer look at Capago and Baz’Art’s collaborative Salt River Street Art Project, and the three exceptional artists who contributed to the event. 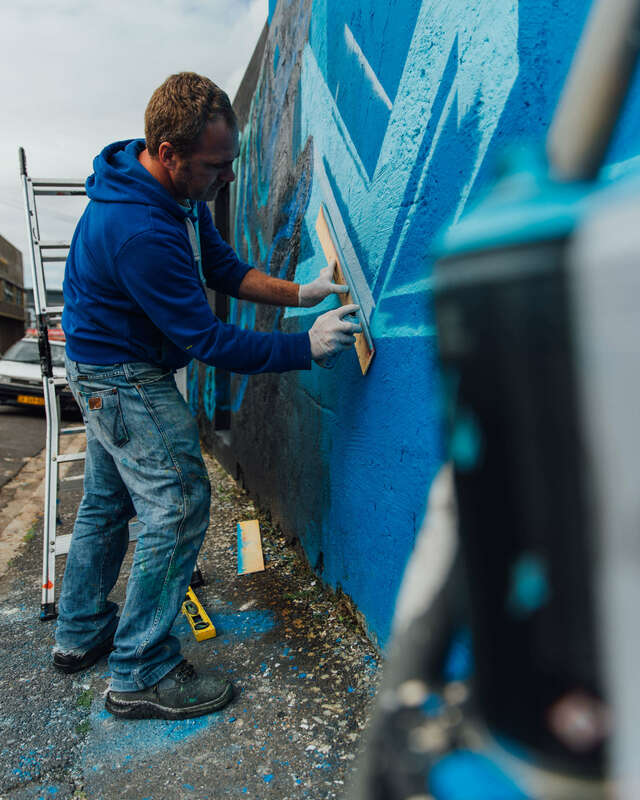 To celebrate 7 years of service in the visa processing industry in Cape Town, as well as their newly revamped premises, Capago Cape Town hosted three street artists representing the three nations they serve. Mak1one (South Africa), Or10n (Italy), and the Silex Project (France) joined forces to create a strikingly symbolic street art installation on a wall in Salt River. Each of the artists has generated an impressive reputation in the international graffiti field. Besides the main wall installation, each artist created mixed-technique pieces destined for Capago International’s Cape Town office. The collaboration and co-creation by the artists strongly represent Capago’s ethos of multi-national service and consensus-building, and further symbolise the unique ties between these three nations. While hosted by Capago, their work (and the project at large) was supported and curated by street-art extraordinaires, Baz’Art. Or1on paints as a local fan looks on. Mac1one works on his personal mixed-technique piece. Or1on works on his signature lettering. Orion, Italian graffiti writer since the 90s, has inscribed the word ‘Origine’ in the centre of the piece, in a contemporary style with geometric shapes. His art reflects the graffiti heritage, with lettering based on a purely 3D style. Once again, it’s about preserving the essence of the movement, its origins and reintegrating it into our present. Mak1one, a local artist, sees graffiti as a visual language of its own, and can express both his personality and his origins. Here, he carries and wants to convey “unity in diversity”, speaking of the different ethnicities that make up South Africa. Who are Capago & Baz’Art? Capago International is the external service provider for the collection of Schengen visa applications in South Africa on behalf of the French Ministry for Europe and Foreign Affairs and the Italian Ministry of Foreign Affairs and International Cooperation. We have four offices located in Johannesburg, Cape Town, Durban, Pretoria and we are present on a bimonthly basis in Port Elizabeth. 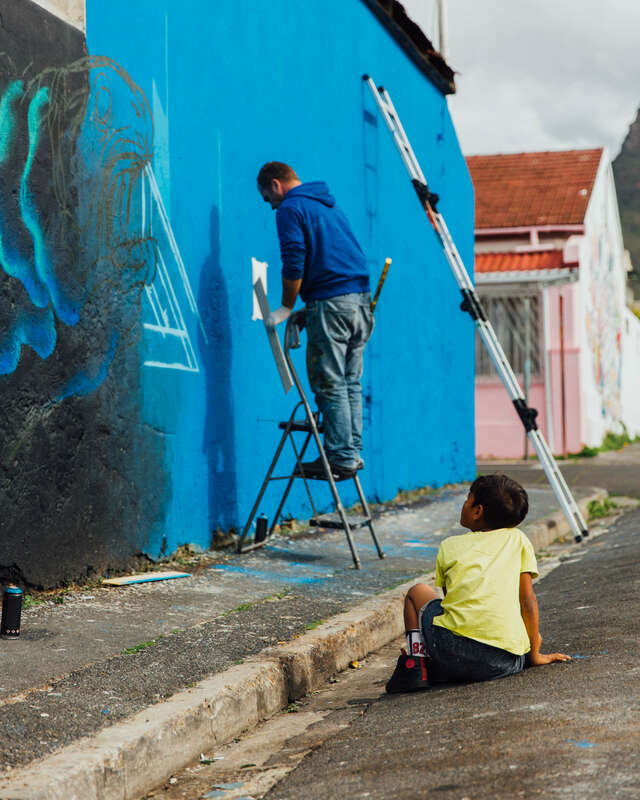 Baz’Art is a non-profit organisation in Cape Town dedicated to showcasing the power of street art and its ability to transform communities and individuals. By building a supportive foundation for the artists, Baz’Art bridges the gap between individuals and the members of their communities, such as educational institutions, community businesses, and local organisations. His Excellency the French Ambassador to South Africa shows off his artistic side. Capago cocktail party guests enjoy Aperol Spritz on the house. The Vice-Consul of Italy in Cape Town speaks on unity. 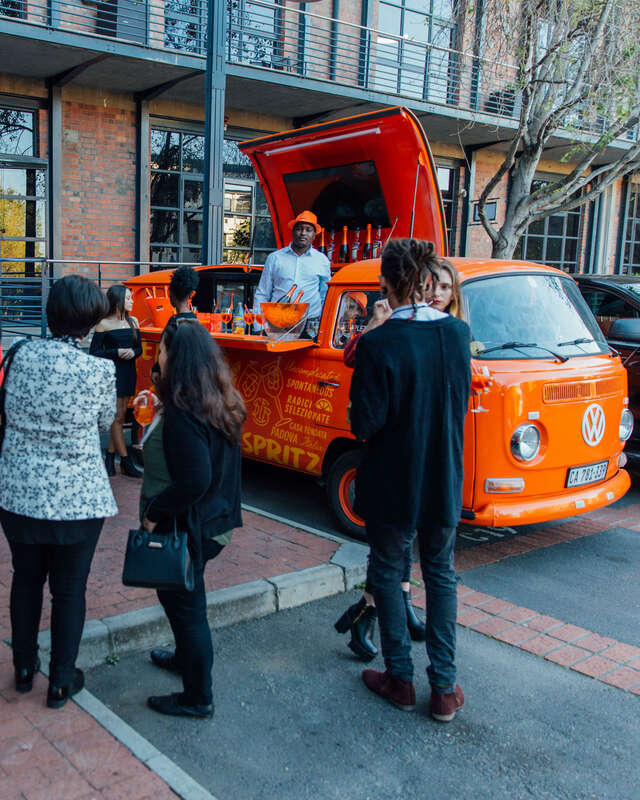 After the unveiling of the collaborative street piece, attendees moved on the the Capago Cape Town premises in the Old Warehouse Building in Observatory, where celebrations continued in the form of a cocktail party. Here, the individual mixed-technique pieces produced by each artist were presented to the Ambassador of France to South Africa, the Consul General of France in Cape Town, the Vice-Consul of Italy in Cape Town, and esteemed guests. 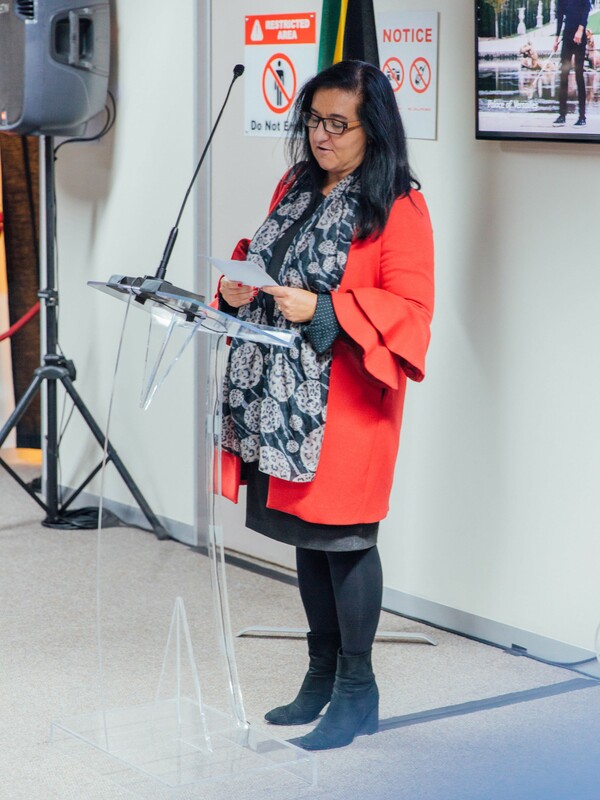 In true international spirit, members of the political, diplomatic and business communities from Italy, France and South Africa rubbed shoulders – all brought together by Capago’s work in the visa processing industry. The Silex Project is a French street-art initiative started in 2017. Their work invites you to embark on a primal and artistic journey into ancient times, questioning our species’ origins on Earth, and imagining new lifestyles that different kinds of evolution would have provoked. Or10n lives and works in Venice. His research started in the early 90s with the study of the morphological composition of the alphabetic letter. Over the years this has led him to an original, complex and unique style, which has been able to develop enormously thanks to his participation in several prestigious graffiti festivals in Italy, Europe and Latin America. Mac1one has been involved in graffiti art for over 20 years. 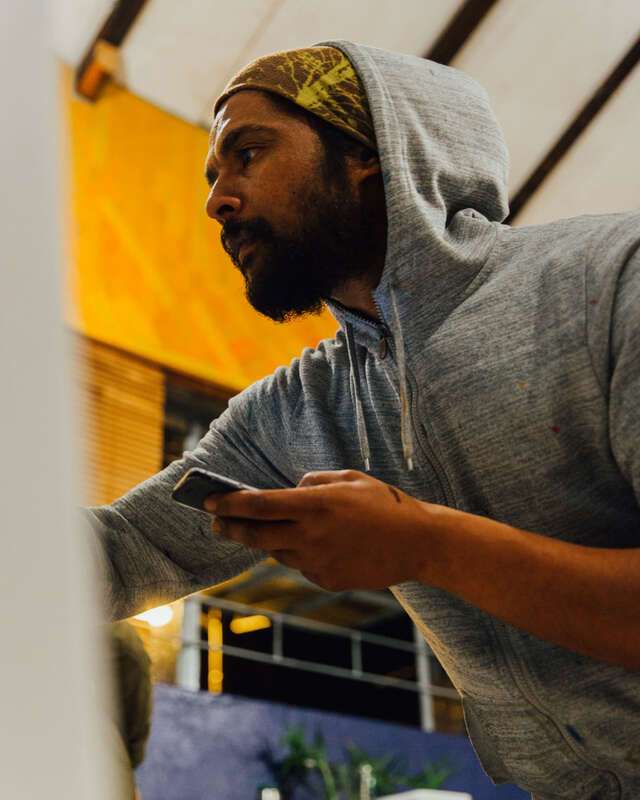 Having personally experienced the power of graffiti to change lives, this self-taught artist is committed to using his work to inform and challenge opinion on the one hand, and to inspire people to pursue their dreams and talents on the other. He has worked extensively as a mural artist in South Africa and abroad. He is a serious and conscious artist with cutting-edge concepts and ideas about the potential of graffiti as an art form.